OnePlus’ custom UI, OxygenOS has been revered by everyone to be the epitome of all custom ROMs. Its simple user experience which is close to stock Android, paired with all the needed features easily fetches it the top spot when it comes to custom UIs by any brand. On top of that, OnePlus’ phones come in the mid-range price segment making the OxygenOS a wildly popular UI among the users. Another reason for the high appraise of OxygenOS is the frequent update timeline which OnePlus follows meticulously. The Chinese brand releases updates almost every month for its latest flagship phones. The newest update for the OxygenOS on both OnePlus 6 and OnePlus 6T, for this month, have started seeding. The recently launched updates include the OxygenOS 9.0.12 for the OnePlus 6T and OxygenOS 9.0.4 for the OnePlus 6. 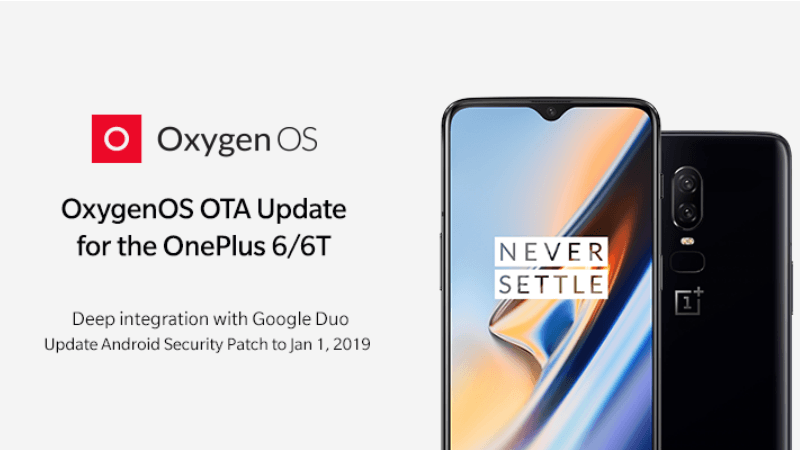 These new updates for the OnePlus 6 and the OnePlus 6T bring onboard the latest Google Security Patch for January 2019 and deeper integration with Google Duo. Notably, the previous Open Beta was the first one to come with the Google Duo integration. The new feature allows the users to make a video call via the Google Duo app from the dialer itself. It is also worth noting that the new Google Duo integration will improve the UI a tad bit more as it will make video calling much more accessible. Since the OxygenOS boasts of having simplicity and ease of use, the new integration will a nice add-on on these lines. As per the changelog, the latest update also brings better optimisation for the screen along with some fixes for the bugs. The security patch will also help fix up some of the loopholes which might have crept in the previous versions of the update. In case you want to check for the update on your OnePlus 6 or OnePlus 6T device then you should head over to the Settings menu, then go to System Updates and tap on “Check for updates”. Like it is the case every time, the update should reach you in a few days as it is being rolled out over-the-air (OTA) in phases. You should also note that although the changelog of both the updates is same, you should not try to install them interchangeably. If you are an advanced user, then there is also the option of flashing the ROMs to obtain the latest update for your OnePlus 6 and OnePlus 6T.